As September 1940 gave way to October, the winds freshened and leaves on the trees started to turn brown as the autumn finally arrived. The noticeable change in the season also heralded the noticeable change in Reichsmarschall Goring’s temperament. Chastised by his Fuhrer over the frustration of the invasion plans, Goring vented his spleen on the Luftwaffe’s fighter units. As they had, in his considered opinion, manifestly failed to protect the vital bombers, they could now carry the bombs to England themselves. 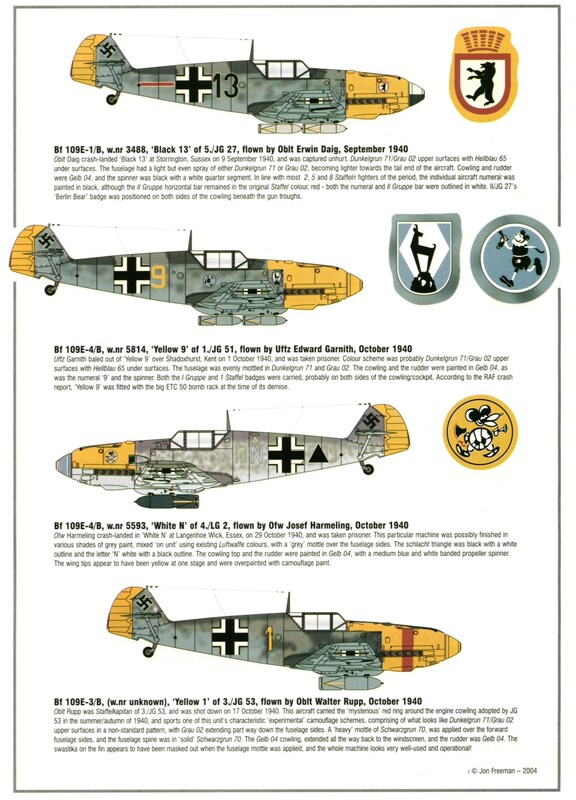 Accordingly, he had one third of the total available fighter strength converted to carry a 500lb bomb under the fuselage of a Messerschmitt 109 or three such bombs under the wings and fuselage of a paraZerstorer. These Jabos (short for Jagdbombers, fighter-bombers) as they were now called, would fly as live-bait, escorted by a vast number of fighters, whose task it would be to annihilate any RAF fighters that tried to intercept them. If the Jabos got through, they were to drop their bombs on the troublesome English below, preferably on a decent target of opportunity; but failing such, anywhere. The German fighter pilots felt thoroughly dejected and angered by this order, and it was an order that came to mark the end of their esteem for Reichsmarschall Goring personally. The autumn weather in England started cloudy, but it was still dry, still mild enough for the Jabos to reluctantly take up their role. Flying as high as they possibly could with their burden of bombs, the Jabos headed for England, escorted by their Kameraden of the Jager, but just as their own enthusiasm for this onerous task was half-hearted, the reaction of the defenders ultimately proved maddening to them. Initially, as RDF couldn’t tell what type of enemy aircraft were coming in, Park had no choice but to send appropriate forces to meet this new threat, which of course, was exactly what the Germans wanted. But after a week of such activity, a specialist unit called 421 Flight was formed at RAF Gravesend, at the behest of no less a person than Winston Churchill. The Flight was formed on October 7th, from a nucleus of 66(F) Squadron’s pilots and was initially equipped with the Hurricane. 421 Flight’s job was to check up on inbound raids and identify the nature of the enemy aircraft involved. Given that 421 Flight’s primary role of spotters meant that they were ordered not to engage the enemy unless attacked themselves, it was soon decided that the faster Spitfire would be a more suitable aircraft for them to use. Because RDF could “see” over much of Northern France, Gravesend’s position was ideal for 421 Flight’s purpose, as the singleton spotter could climb steeply as he flew south over Kent to take up his high-altitude position over the Channel. Once in position, he relayed the necessary information back to his controller by radio and sped back to Gravesend as the appropriate numbers of defending fighters were “scrambled”. Once 421 Flight was established, Dowding and Park simply wouldn’t play the Germans’ game. Both men realised that the paraJabos were the last act of a desperate Reichsmarschall and could have little more than a nuisance value, so Park steadfastly refused to despatch the massive fighter formations that the Germans wanted him to, in order to deal with them. Park sent just enough of his own fighters to chase the dispirited paraJabo pilots away. More than anything else, it was the introduction of the paraJabo at the same time as the German day bombing raids diminished, which convinced Dowding and Park that the Battle of Britain was all but over. But after ten days of their spotting operations, 421 Flight had lost four aircraft, shot down by German fighters. At such high altitudes, the two-stage supercharger of its DB601 engine gave the Messerschmitt 109 a distinct edge in performance over its British adversaries. From October 18th, 421 Flight’s spotters were despatched in pairs, one to spot whilst the other provided cover. Meanwhile 66(F) Squadron, despite being in the thick of the fighting, hadn’t paraofficially lost a pilot since they’d moved to Gravesend, though Pilot Officer C. Bodie had a narrow squeak on 5th October. During combat with German fighters, his Spitfire suffered engine damage and also had most of its starboard wing physically torn to shreds by cannon shells. Three-quarters of his Spitfire’s starboard aileron was missing and the wingtip was hanging on by a thread, but Bodie somehow managed to gingerly coax his aircraft, with its unhappy Merlin and its disintegrating starboard mainplane, back to Gravesend; arriving quite literally on two-thirds of a wing and a prayer. To the astonishment of all those on the airfield who were anxiously watching his approach, he made a successful wheels-down landing, leaving his awestruck ground crew to wonder at how, paraexactly, the severely damaged fighter had stayed in the air at all in such a condition. Despite such incredible luck as Pilot Officer Bodie’s, 66(F) Squadron now had their run of good fortune regarding pilot casualties ended. On 4th October, the day before Bodie’s miraculous return, Flight Lieutenant Kenneth McLeod Gillies, the Squadron’s popular ‘A’ Flight Commander, had been reported missing, following the successful interception of a Heinkel 111 bomber off the East coast. There was still no official news of him yet. On 8th October, Pilot Officer George Corbett, a Canadian, was shot down in combat over Eastchurch. Corbett was still in the cockpit of his Spitfire when it crashed and burned on Bayford Marshes, near Upchurch. The twenty-one year-old was German “Ace” Adolf Galland’s forty-third victim. Also lost that same day was Sergeant Pilot Rufus Ward. He too was shot down in combat with Messerschmitt 109’s and was killed when his Spitfire crashed at Borstal, near Rochester. On the 11th, 421 Flight lost Sergeant Pilot Charles Ayling, formerly of 66(F) Squadron, when his Spitfire crashed at Newchurch following combat with enemy fighters over Hawkinge. On the 17th, Pilot Officer Hugh Reilley, an outgoing, twenty-two year-old who was another of 66(F) Squadron’s Canadian pilots, was shot down and killed by another German “Ace”: JG51’s Major Werner Molders. Reilley’s Spitfire, R6800 LZN, crashed in flames at Crockham Hill, near Sevenoaks. Of the other RAF casualties suffered as a result of the large high-altitude fighter sweeps that the Germans made over Kent at the time, some were not necessarily realised as being such. In particular, two that occurred on the 10th involved two fighters from different squadrons, 249 and 253 Squadrons respectively. The two aircraft crashed within minutes of each other in two totally separate though exactly similar, incidents. In both cases, the pilots, 249’s Sergeant Pilot Edward Bayley and 253’s Sergeant Pilot H. Allgood, were seen by their squadron comrades to suddenly drop out of formation and head straight for the ground, for no apparent reason. Despite urgent radio calls, neither pilot responded, both aircraft diving ever more steeply and each seemingly bent on self-destruction. One of them, the Hurricane piloted by 249 Squadron’s Sergeant Bayley, made a lasting impression when, with its engine screaming, it slammed straight into the ground on Marshgate Farm, at Cooling, on the Hoo Peninsula, not far from “Shades House”. At the time, both crashes were put down to Oxygen failure, which neatly explained the respective pilots’ failure to respond to their radio. If their Oxygen supply had failed at altitude, both pilots would have been rendered unconscious. The symptoms certainly seemed to fit. However, Geoff Nutkins of the Shoreham Aircraft Museum told me that Bayley’s crash site was partially excavated a few years ago and one of the items recovered was the armour plate from behind the pilot’s seat. This plate bears a large hole, at head level, of the type and size that can usually be safely attributed to a 20mm cannon shell from a Messerschmitt 109, fired at close range. As we have already seen from Gerhard Schopfel’s example when he gave 501 Squadron such a black day on 18th August, the RAF’s rigid flying tactics, when cleverly exploited by an unseen “Lone Wolf”, could also lead to sudden losses like these. At present, the front section of Sergeant Bayley’s Hurricane still lies deep in the marshland soil at Marshgate Farm, but if the hole in his recovered back armour is anything to go by, it is no wonder that Bayley didn’t respond to the radio calls from his squadron mates. It is extremely doubtful that the unsuspecting Bayley ever knew what hit him, but thanks to that partial excavation, we now have a much clearer idea of what probably happened to him. It is equally possible that the cause of Sergeant Allgood’s death may well have been strikingly similar in this respect also. Of course, it wasn’t just enemy action that could cause losses. At 13:50 on 13th October, Pilot Officer J K Ross of 17 Squadron was forced to bale out of his stricken Hurricane, P3536, after being hit by the well intentioned, but sadly mistaken marksmen who were manning the Chatham Anti-Aircraft guns. Unfortunately for the hapless Ross, the gunners had added injury to his doubtlessly considerable insult, as he had been wounded. Coming down to earth on his parachute and no doubt in some pain, he watched his Hurricane as it crashed on the bank of the River Medway. Shortly after landing, Ross was taken to Gravesend Hospital, where he was admitted for treatment. Meanwhile, the Luftwaffe’s night Blitz on London continued unabated. Night after night, the German bomber streams crossed the Channel to rain death and destruction on the population below. The Luftwaffe also started dropping parachute mines on London during this time. A fiendish development to say the least, it was simply a contact operated, two-ton sea mine, suspended from a parachute. It fell silently and unlike conventional bombs, it could not hope to be aimed at a specific target due to its tendency to drift as it descended; and of course, it contained enough explosive to sink a ship. It was purely a weapon of terror. 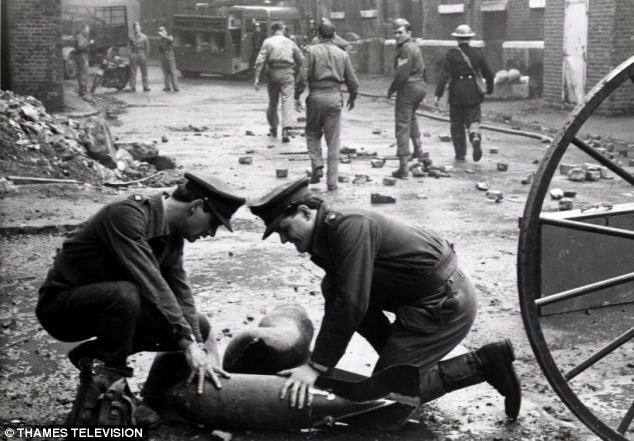 As well as regular bombs and the parachute mines, the Germans dropped tons of small incendiary bombs, filled with oil. “Firebomb Fritz” as these remarkably effective devices came to be known, caused widespread damage to the City of London and was probably the most effective device the Germans used. As they were delightfully cheap for the Germans to produce, the Luftwaffe obviously felt obliged to drop them on London by the thousand. My late paternal grandfather, whom we always called “Diddy” (due to his being the shortest member of the family), was a serving London Fireman during this time. Now if there was one thing Diddy had always enjoyed, it was driving. Piloting a Dennis Fire Engine, bell ringing, through London’s blacked out, bomb-damaged streets on his way to yet another “shout” during the Blitz of 1940, suited him down to the ground. In fact, in later years he used to drive his Morris Oxford saloon car in much the same manner, never once using the clutch, as the Dennis Fire Engine of his day had what was commonly referred to as a “crash-change” gearbox. Diddy therefore opined that a clutch pedal was simply a luxury item, fitted solely for use by lazy drivers. It was a good job for him that his Morris cars all had a strong gearbox. One story that he would often tell was of one particular night, shortly after the start of the Blitz, when his crew were called out to some blazing warehouses on the riverfront in his native Bermondsey. They’d arrived to find a Fireboat already on the scene in mid-river and a crew of the AFS (Auxiliary Fire Service) with their Taxi-towed pump, who seemed to be struggling to connect their hose to a Fire hydrant. Diddy, by virtue of being the driver, was nominally in charge of his Fire Engine’s pumps once he’d got his crew to the scene. Diddy couldn’t understand why the AFS crew were having so much trouble trying to connect their hose to the hydrant, so he quickly went to see if he could help them, whilst the crew of his engine ran out their own hoses. It was then that he realised that at this early time, the AFS’ hoses though of the same diameter as the standard Fire Brigade hoses, had a coupling that was different and would therefore not fit the hydrant, an official oversight that he for one found “plain stupid”. As the Thames was near high tide, he ordered the AFS crew to sling their feed hose into the river and use the water from there while he connected the feed hose from his engine, which he knew would fit, to the hydrant. The AFS crew got a marginal head start before Diddy opened up the pumps on his engine. As the AFS crew’s jet began gushing muddy river water at the blazing warehouses, Diddy’s hoses emitted nothing but an embarrassing splutter, and dribbled. The bombs had blasted the water main feeding the hydrant. Diddy duly shut his pumps down, disconnected the feed hose from the hydrant and threw it into the river alongside that of the AFS crew. Using the Thames as a source of water had its drawbacks though, as Diddy and the AFS crew quickly discovered. The powerful pumps on Diddy’s engine could handle over 1, 100 Gallons of water per minute at full bore. It wasn’t long before the feed hoses became clogged with mud and debris from the Thames and once more, the pumps ran dry and the jets spluttered and died. The warehouses, with their timber floors and roof beams, burned to the ground, chiefly through a lack of water, as the determined efforts of the Fireboat were simply not enough to control the blaze. Dejectedly, the crews unblocked their hoses then packed up and left the scene. Naturally, this event was the subject of much discussion back at the Fire Station. Word soon spread round the Central London Fire Stations that other crews had encountered the same problem, but there was a solution. One crew from another Fire Station had come up with a novel but very effective idea for a filter by taking the waste paper basket from their Station office and tying it over the end of the feed hose prior to dropping it into the Thames. The basket in fact proved to be a remarkably efficient filter. Having sent word of this success round to the various other NFS London Fire Stations, it wasn’t long at all before there were no longer any waste paper baskets to be found in any of the various Fire Station offices. This measure proved so successful that proper basket weave filters were hurriedly produced and issued to London’s Fire crews and the AFS units, which was just as well, as there was no let up in sight in the Luftwaffe’s campaign of nocturnal arson.